So I’ve had made some changes to my skincare routine over the past few weeks and the only products that I am using now are from the brand Deciem. In case you’ve not heard of Deciem, it is a Toronto-based company with a rather unusual tagline – “The Abnormal Beauty Company“. 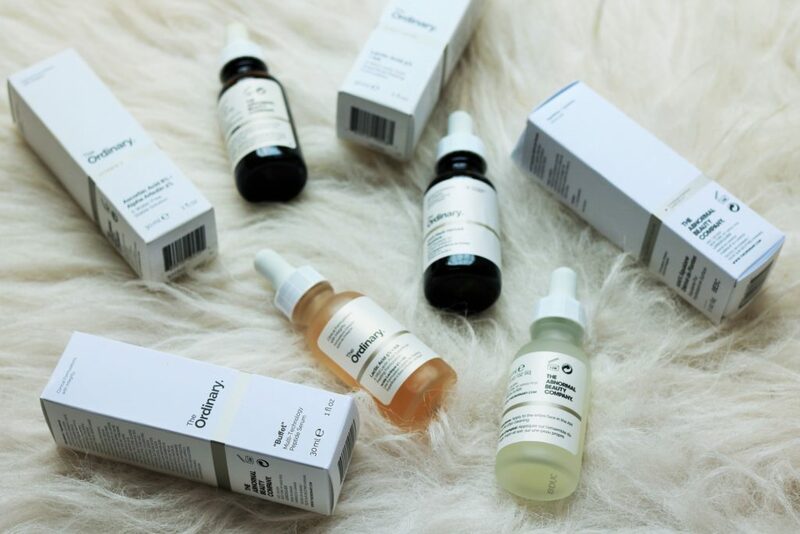 Deciem has a number of brands under its umbrella but the one brand that is proving to be a game changer in the skincare arena is The Ordinary. Deciem The Ordinary provides a range of treatments centered around pure skin-friendly ingredients like vitamins, retinoids, acids, hydrators and oils and the best thing about the brand is the pocket-friendly prices. The packaging is also fuss-free and minimalist. Couple of months back when I was in London, I visited the Deciem store in Covent Garden and asked the SA to suggest some products. 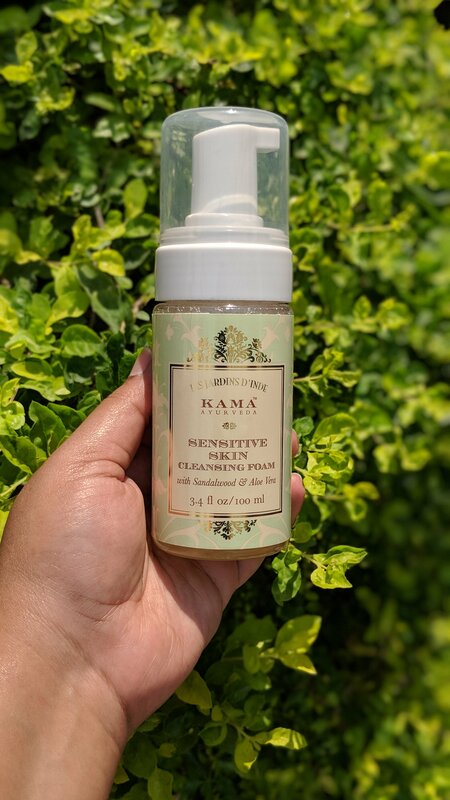 She checked my skin, asked about my skincare concerns and I said that I wanted products to get rid of pigmentation, brighten and even out the skin tone, prevent fine lines and aging and in general, improve the appearance and health of my skin. Since I have combination type sensitive skin, I did not want to try anything too harsh so she suggested the below products. Please note that while all of Deciem The Ordinary products are safe and I’ve not experienced any adverse reaction on my skin, it is always best to consult the specialists before adopting a new skin care regime. I know it is tough when the products are not available in your country but do read up about the brand/products/ingredients before buying anything. 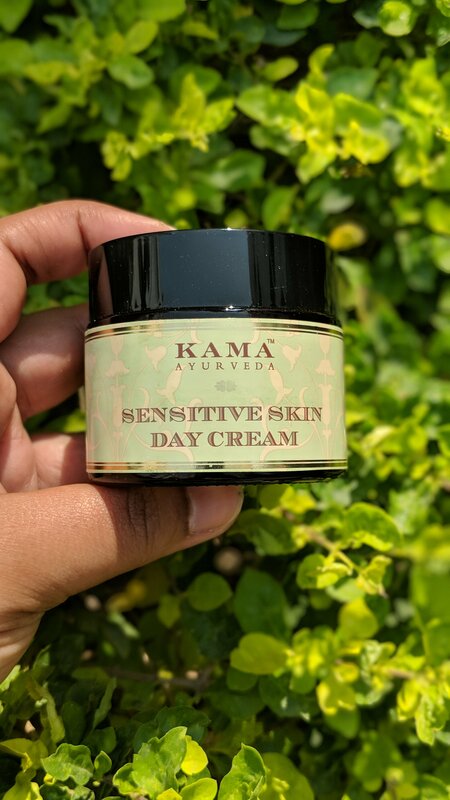 Also, all of these clinical formulas make the skin very sensitive towards UV rays so it is absolutely a must to wear a sunscreen with a high SPF once you start using the products. 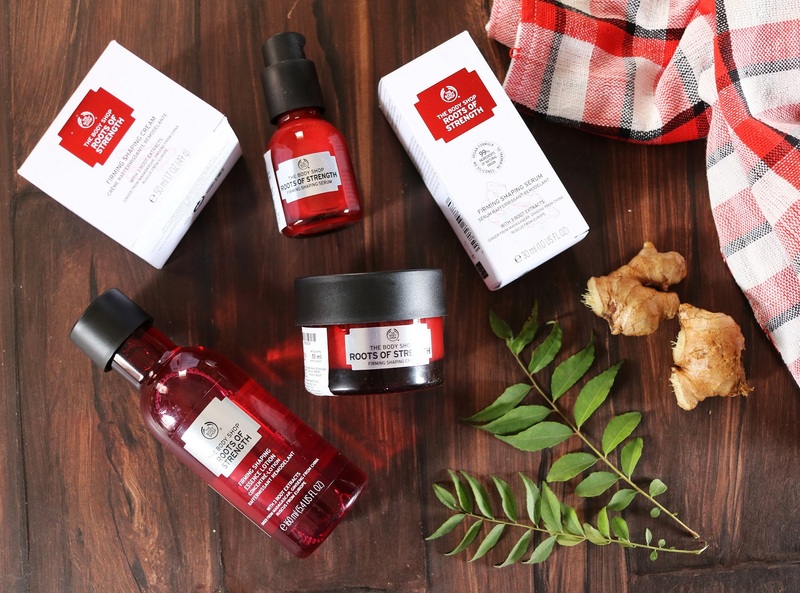 The Body Shop Roots of Strength is the latest skincare range from the brand consisting of three products – Firming Shaping Essence Lotion, Firming Shaping Serum and Firming Shaping Cream. 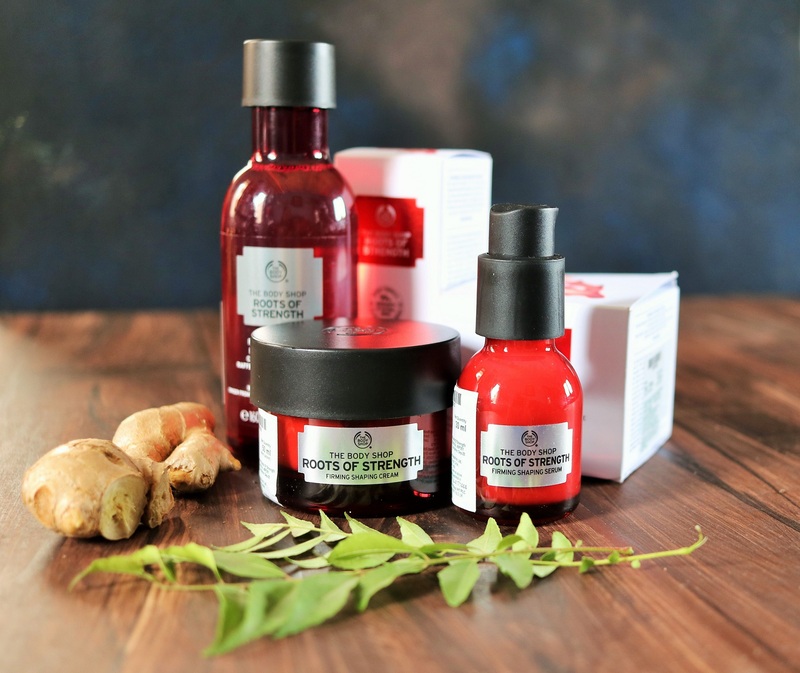 Formulated around the key ingredients of Madagascan ginger root, Chinese Ginseng Root, European Ruscus Root and Community Trade Soya oil from Brazil, the range is aimed at mature skin above 45. I asked my mum to try out the products and she has been doing so for nearly 2 months so it is a good time to write down the review. 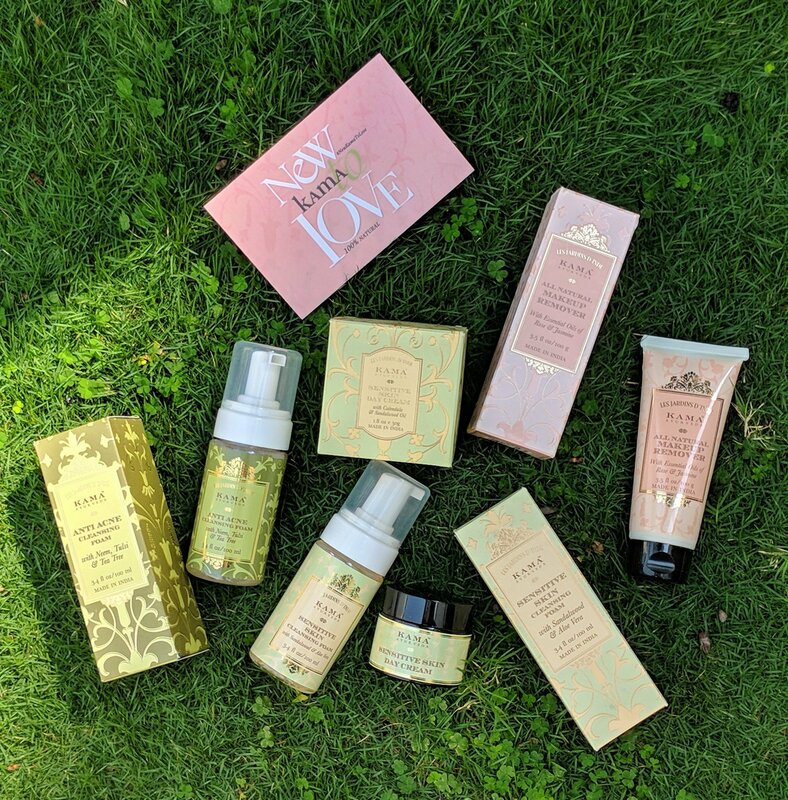 Please note that I have not tried the products and the below experience is my mum’s who is 60 years old. The Chinese have been using roots to look after their skin for centuries. 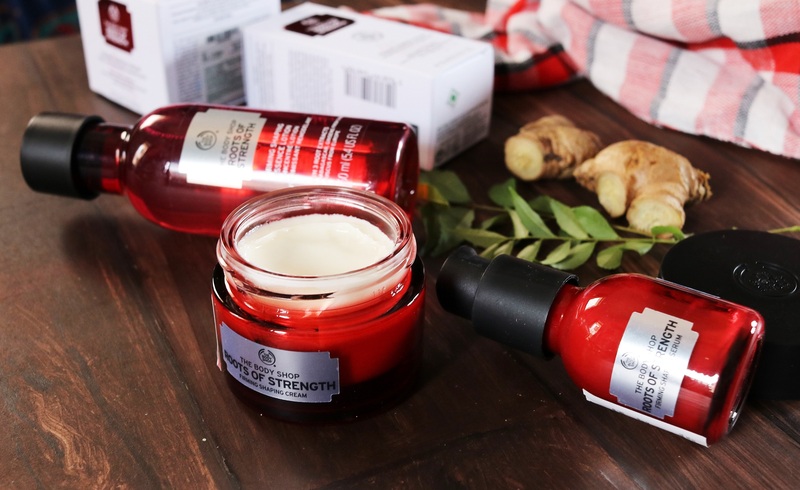 Like the natural roots used to boost immunity in Chinese medicine, Roots of Strength is infused with three powerful plant roots to help restore your skin’s strength and shape; ginger, ginseng and ruscus root. 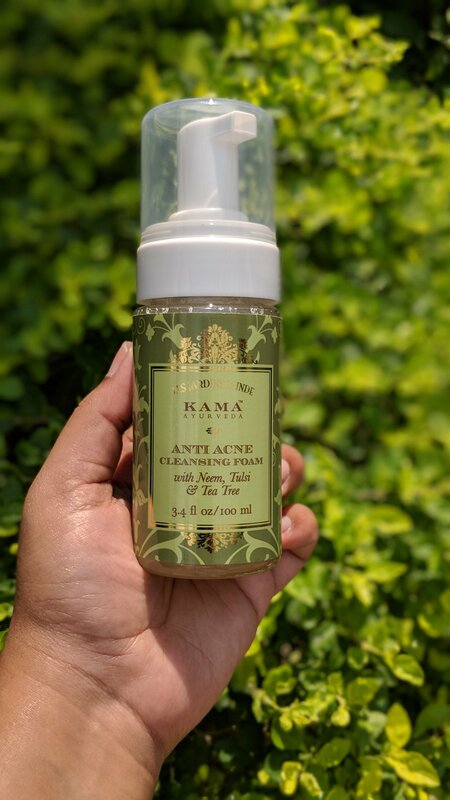 Firming Shaping Essence Lotion (Rs 1595) – This refreshing daily essence lotion is an essential next step after cleansing to help prepare and activate your skin for the benefits of the routine. Combining the lightweight freshness of water with the comfort of a moisturising gel. Firming Shaping Serum (Rs 2595) – This uplifting serum glides effortlessly onto skin. From your jawline to every contour, skin feels moisturised and looks smoother, plumper and firmer, as if strengthened. Firming Shaping Cream (Rs 1795) – This silky cream is wonderfully rich yet non-greasy on application. 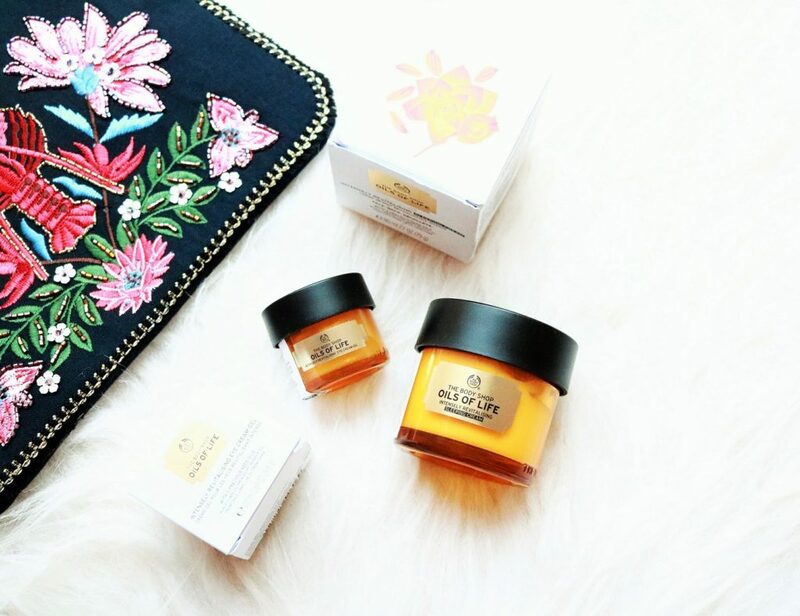 With a fresh, spicy scent, the refreshing formula helps skin to appear firmer and plumper. The below is written by my mum and edited by yours truly. . 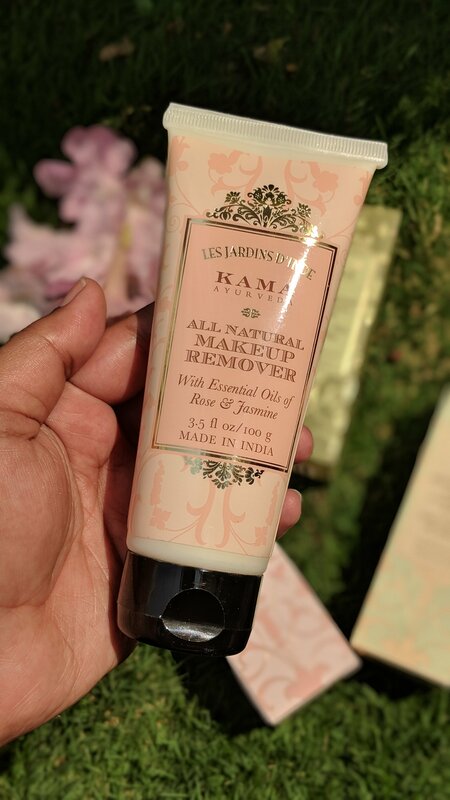 Unlike all you younger girls, packaging of products don’t really bother me too much but all I can say is that the products in their red bottles and tub look very attractive. 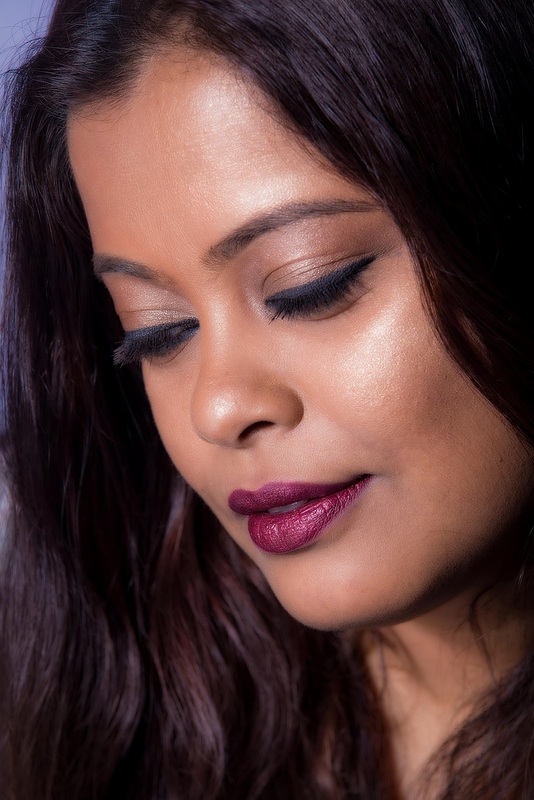 I have combination skin with an oily t-zone so I always use products that don’t add to the oiliness. I am glad that these products don’t. The Firming Shaping Essence is the first step in the regime and I apply it after cleansing my face. It feels like water with a light herbal scent. The first thing I noticed after applying the essence was the slight tingling sensation. In fact, that is the case with all the products in the range. The sensation does not last long. During the day, I only apply this essence and it keeps my skin moisturized for a long time. At night, I follow it up with the rest of the products. The Firming Shaping Serum is the next step and it is white in color and has a gel-like consistency. Even this gives a slight tingling sensation but I like that it feels weightless and absorbs into the skin very fast. The Firming Shaping Cream is to be applied next and it is a rich cream in texture so I apply only at night. The good thing about the cream is that it does not make the skin greasy/oily. It moisturizes very well and makes the skin very smooth. I have been using these products for nearly two months now and I have seen results. Even my friends have told me that my skin looks smoother and I have noticed some of the spots lightening. 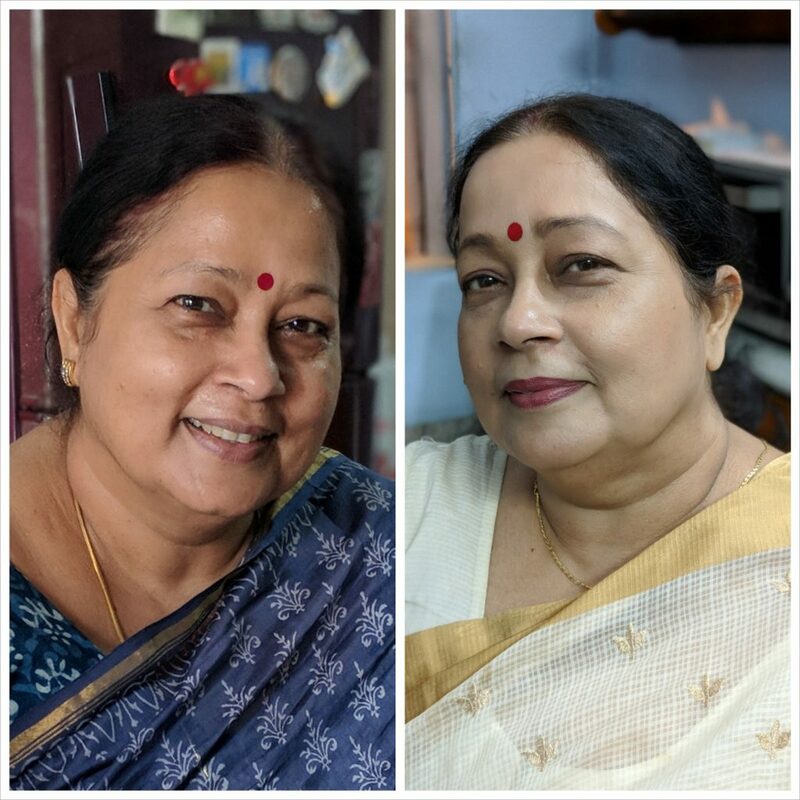 At the age of 60, I cannot expect the lines and wrinkles to go away but my skin’s texture and appearance have visibly improved. It feels firmer and well moisturized. I will recommend this range to all you mature skin beauties. Here’s a before and after. Left is the before without a speck of makeup and right is where she has compact powder on. 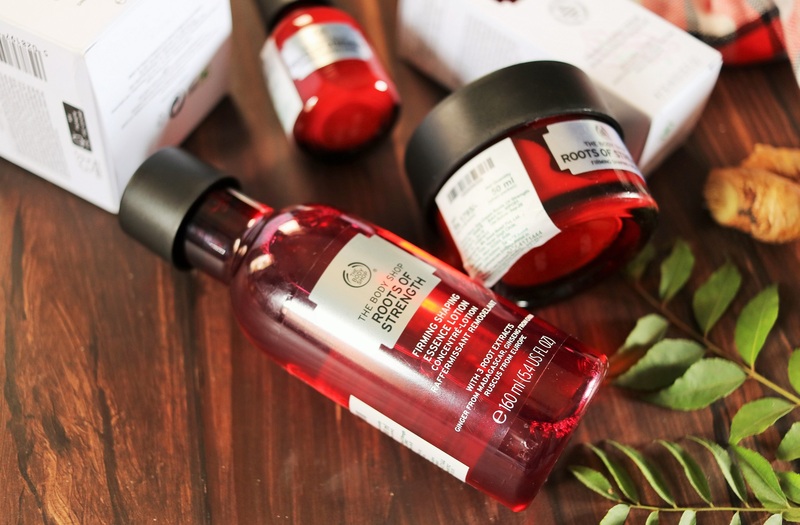 After launching a makeup line last month, The Body Shop is back with a number of new skin care products. 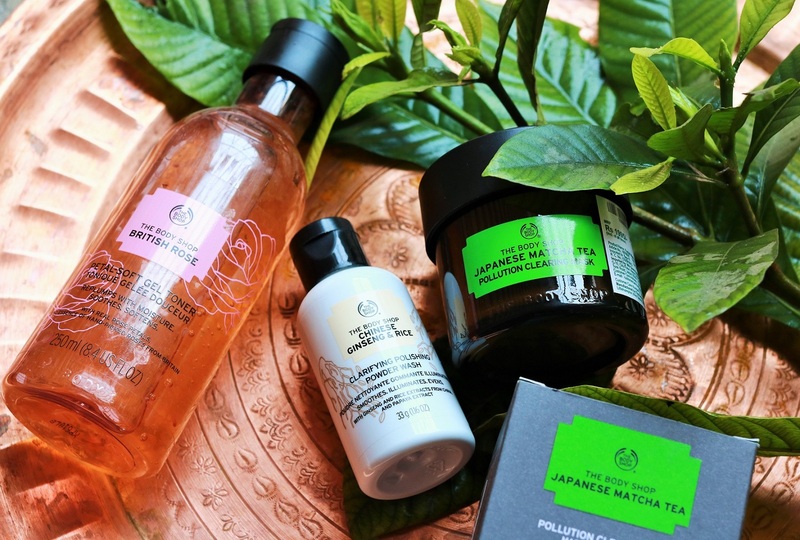 Amongst them are the Japanese Matcha Tea Pollution Clearing Mask, British Rose Petal-Soft Gel Toner, Chinese Ginseng & Rice Toner and Chinese Ginseng & Rice Clarifying Polishing Powder. Out of the four, I have three products sent to me by the brand and I’ve been trying them out every day for the last 1.5 weeks. Here are my initial thoughts on these new launches.